Opal Pools & Bath needed a logo designed as they had been operating for almost three decades without one. A web presence is in the works, but they just needed a modern logo that was versatile enough to be used on various business correspondence and signage. I went with one of the most beautifully done smallcaps sans typefaces: Base 12 for this branding and modified it, rounding the corners and drawing inspiration from a droplet of water to modify the first letter of the logotype. Because of their industry, I wanted to keep the water imagery without making it too over-the-top and obvious. Base 12 was paired with the Tisa typeface to provide for a serif contrast as well as a modern, but traditional face to set correspondence. For color, I stayed away from bright blues and settled for a dark turquoise green/blue motif and a light green/blue color as an accent. Large chunks of color were used for the backs of the business card and front and front flap of the envelop, but I kept the other pieces of stationary minimalist. 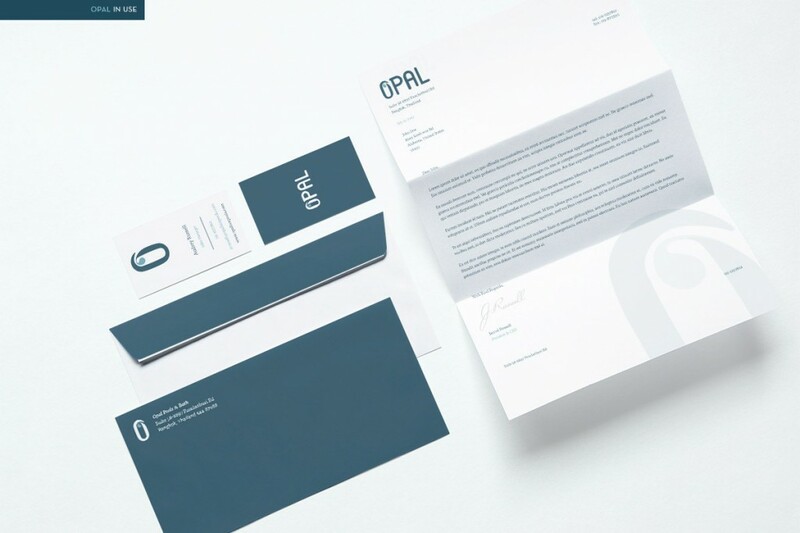 Opal’s branding was completed in 2015. Along with the logo, a letterhead, business card set and envelop design was included.